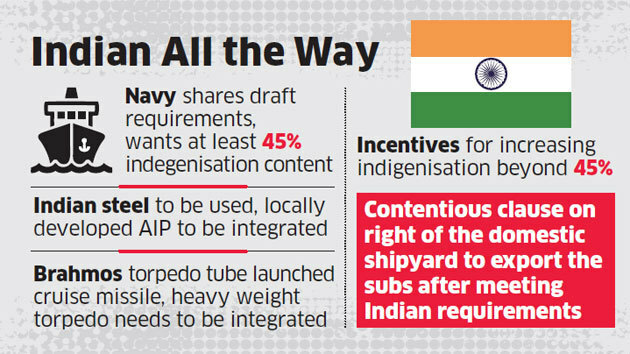 NEW DELHI: The navy wants Indian steel, missiles, torpedoes and an indigenously developed air independent propulsion system for its Rs 40,000-crore project to construct six new submarines domestically, one of the largest ‘Make in India’ military orders currently being processed by the government. The project, which has been moving faster than another mega plan to build 110 fighter jets in India, has been taken forward with the navy sharing its draft requirements with foreign players who are to share technology with Indian partners to produce the next generation of submarines. The requirements, which will be finalised in the coming months before being formally issued to all competitors, make a strong case for Indian systems to be fitted on the submarines with at least 45% indigenisation content. The new technology that will differentiate these submarines is Air Independent Propulsion (AIP), a technology that enables the boats to stay underwater for weeks, unlike earlier models where they have to surface after a few days to recharge batteries and take in oxygen. As per the draft requirements, foreign players have to certify that they will integrate a ‘proven indigenous AIP’ if required by the navy. This would be a reference to an AIP that is currently under development by DRDO and is being shore tested as of now. The navy has also stated that it wants to utilise indigenously developed steel for the construction of the submarines as far as possible. In fact, the navy will include special incentives in the program for foreign players that use Indian steel for the program. The biggest boost for Indian developed systems is the requirement for foreign vendors to ensure that an indigenously developed heavy weight torpedo has to be integrated to the submarines. The project is currently being undertaken by DRDO that has already supplied such torpedoes for warships and is working on a submarine launched version as well. India’s missile program also finds mentions in the requirements, with the navy set to mandate that the submarine torpedo launched cruise missiles (SLCM) being developed domestically are to be a part of the weapon suite. The BrahMos missile complex is currently working on a next generation missile to meet such requirements. The submarines to be built are to have a minimum service life of 30 years and would have to be upgraded and served in India throughout this period. However, one clause that the navy has put in its draft requirements that mandates all copyrights for the submarine to be vested to India may raise concern by foreign players who are to share technology. The clause says that post the delivery of the sixth submarine, India will have the unlimited right to produce more of the submarines or modify them.